Exclusive double-floating, self-aligning oil lubricated mechanical cartridge seal with stationary and rotating face of silicon carbide is specifically designed for abrasive industrial wastewater service. Removable cover plate provides quick and easy access to pump interior without disconnecting piping. Clogs can be removed and pump returned to service in minutes. Impeller, seal, wearplate and flap valve can also be accessed through cover plate opening for inspection or service. T Series pumps feature replaceable wearplates which fasten to the cover plate and can easily be removed for inspection or service. No expensive castings to replace. Removal of rotating assembly allows easy inspection of pump shaft or bearings without disturbing pump casing or piping. On most models, simply remove four bolts from the back of the pump and the rotating assembly slides out. 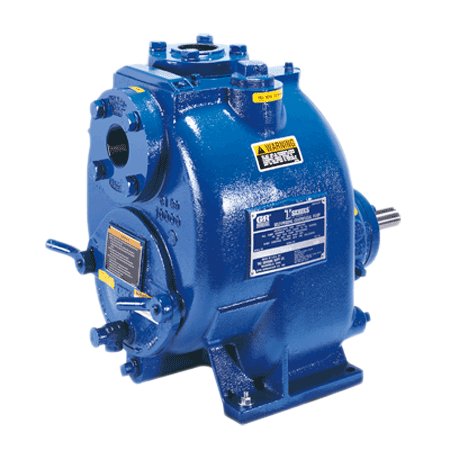 T Series Pumps are available as basic units for connection to customers' power source or may be flex-coupled or V-belt driven by an electric motor. Pumps may also be powered by gasoline or diesel engines. Electric motor driven pumps with "standby" engine power are also available.